I hit a major milestone a few days ago and I didn't even talk about! I'm still kind of in shock that I'm holding up so well due to my long separation from one love. Remember my love? If you don't, here's the post to catch you up to speed. Goodbye My Love! I separated from love on March 22, it's now April 28. It's been just over one month. That's a loooong time. I was fully expecting a painful separation. So, how am I doing? Pretty dang good if I do say so myself. I've been pleasantly surprised. Here's a few things I've discovered over the past month? 1 - I've found that I don't crave it anymore except in times of stress. I got hit with majorly bad news this week about my dad's health and my first comment (after I stopped bawling) was, I just want a Coke. I find it interesting that this is the case. I realized that soda, Coke specifically, really was a comfort thing for me. Somehow I need to trigger my brain into thinking spinach is the new Coke. That would be a good thing, right?! 2- I've learned that my actions can encourage other people too - ok, don't roll your eyes at me, I know that sounds stupid or like a no-brainer. But, after three weeks of going without soda and noticing some differences, it means a lot when your 14 year old daughter turns to you and says, "I've been thinking and I've decided I'm not going to drink soda anymore either." Or when you are shopping with your 10 years olds and one of them sees soda and tries to hug it (yes, she's dramatic!) and the other one says "we haven't had it for so long it would probably taste gross." Those are comments to be treasured. They are realizing that their life can go on without it too - YEAH!!! Ya know, as a mom I always worry about my example, I try to watch what I say, I don't swear, I try not to pass judgments of others in front of my kids, I try to keep a safe environment in my home but I never realized that loving soda so much was encouraging my kids to do the same. I know, Duh! Why is it that sometimes the simplest things complete escape us? 3- I've found that if I drink something, like lemonade out of a cup with a lid and a straw it increases my desire for a soda. We had lemonade at the movie one day and I've decided I can't do that anymore. It still has a lot of sugar and the similarities are too close and I noticed the desire for soda slightly returning. 4- The most important thing I've discovered is that .... I CAN DO THIS. Which means I can probably do a lot of other things that I've been putting off too like, exercise. And, just for fun I thought I'd share a drink recipe I enjoy. Now, no bashing please, I don't drink this very often, but once in awhile when I want something more flavorful than water I will mix this up. Yes, I'm aware juices aren't always great for you. It's not calorie free and it does have sugars in it, but every once in awhile it is just enough of a treat. 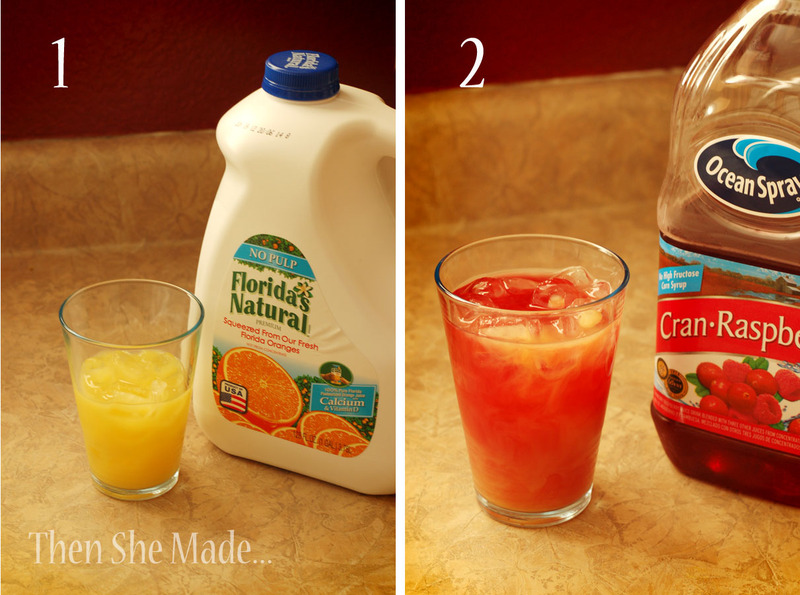 You will need Orange Juice and Cran-Raspberry juice. Plus, a glass of ice is a must to make this complete. 1- Fill half of glass with Orange Juice. 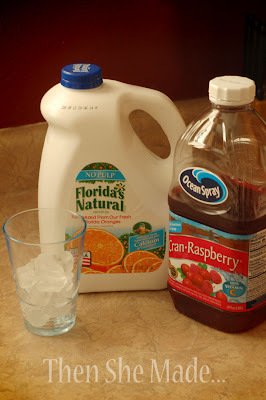 2 - Then fill the remained with Cran-Raspberry juice. Way to go Amy! Hang in there! I haven't really been a huge cola/soda drinker before but I had this special thing with Dr Pepper slurpees in high school. I gave them up years ago, but every so often I just really WANT one. It's probably a comfort thing like you were saying.... now if only I could give up chocolate, cookies, ice cream.... lol. You are doing so well! My neighbor was a heavy Pepsi drinker (few cans each day). When she was diagnosed as Diabetic, she had to quit the Pepsi...it wasn't a pretty breakup! You can do hard things! My favorite summer refresher is shaved ice (thank you Mother-in-law for the Hawaiian Ice machine :) with Simply Limeade. Soooo good! Congrats on the break-up. Great job sticking with it! Happy one month! I loved soda much like you did and recently gave it up. It's been just over two weeks for me and I was shocked at how easy it has been! You are absolutely right about it being a comfort. My most intense cravings have been when I was sick with a cold (my gawd I wanted those bubbles! How delightful the would have felt on my sore throat!) and in times of stress - which is usually Monday through Friday. LOL But I push through and don't give in. I will admit, you and your blog inspired me to make the decision and rise to the challenge. Keep it up! The other funny thing was my sister in law said it had been six years since she had one yet still had a craving every now and then. When she said that, I realized that I had not made the long term commitment in my mind. I was telling myself this was just temporary. I am not really sure where I stand with it now, but when I thought about going six years without one, I just laughed. I cant imagine going without a soda for that long!